1Sher-I-Kashmir Instituite of Medical Sciences Srinagar, Jammu and Kashmir, India. 2Department of Medicine, Medical College Srinagar, Jammu and Kashmir, India. Myonecrosis; Hypertensive encephalopathy; Diabetic retinopathy; Diabetic muscle infarction. Diabetic myonecrosis is a rare and underdiagnosed complication of long-standing, uncontrolled diabetes. It usually occurs in patients with long-standing diabetes in the presence of microvascular complications. Thigh muscles are more commonly affected and the usual presentation is thigh swelling with or without pain, systemic features being rare. Magnetic resonance imaging is the gold standard for diagnosis. Most patients recover spontaneously with bed rest, adequate analgesia and good glycemic control. 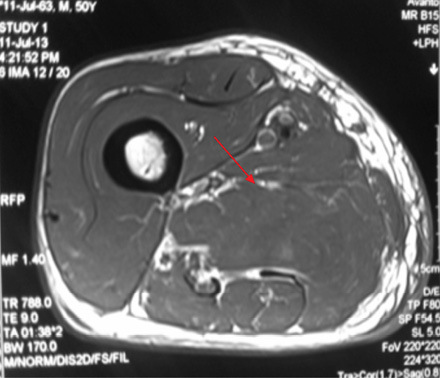 We present a case of recurrent myonecrosis of adductor muscles of the thigh in a patient with long standing type 2 diabetes mellitus who recovered with conservative management. Diabetic myonecrosis, an overlooked complication of longstanding diabetes mellitus, was first described by Angerwall and Stener in 1965.1 It usually affects quadriceps muscles but other muscle groups may be involved rarely. Painful swelling of the affected muscle group without systemic manifestations is the usual presentation. Women are more frequently affected than men and most of the affected patients already have other microvascular complications of diabetes. A hyperintense signal on T2-weighted images in the presence of classical clinical findings provides sufficient evidence for diagnosis. Short term prognosis is good and most patients recover spontaneously with bed rest, adequate analgesia, and good glycemic control. A 49-year-old male, with type 2 diabetes mellitus (T2DM), and hypertension for 10 years presented with persistent uncontrolled blood glucose levels for the past four months with history of agitation, blurres visionly and altered sensorium for the previous two days. There was no history of fever, flank pain, cough, headache, vomiting, and weakness. Drug history revealed that diabetes and hypertension managed by treatment with glimepiride 4mg, metformin 1g, vildagliptin 50mg and telmisartan 40mg. On examination, the patient was agitated and frantically moving all four limbs. Vitals revealed a pulse of 86 beats/min and blood pressure of 190/110mmHg. There was no pallor, icterus, cyanosis or edema, and jugular venous pressure was normal. Examination of the chest, cardiovascular system and abdomen were unremarable. Neurological examination revealed grade II encephalopathy and there was no focal neurological deficit. Fundus revealed diffuse hard exudates, micro-aneurysms and bilateral papilledema. Laboratory evaluation revealed random blood glucose of 20mmol/L, serum sodium of 138mg/dL, serum potassium of 3.8mg/dL, pH 7.43, bicarbonate 24.5 and serum creatinine of 0.76mg/dL. Urinary ketones were negative and routine examination of urine was normal. Other biochemical parameters including, creatine phosphokinase (CPK), and lactate dehydrogenase (LDH) were normal. The result of electrocardiography, chest X-ray, ultrasonography (USG) abdominal and non-contrast computed tomography (NCCT) brain were also normal. A diagnosis of acute confusional state secondary to malignant hypertension and severe hyperglycemia was made and the patient was started on intravenous (IV) fluids in the form of 0.9% saline, insulin and labetalol infusion. The patient’s general condition stabilized after 24 hours of hospitalization and was out of encephalopathy with blood pressure of 130/80mmHg and blood glucose in the range of 7–13 mmol/L. The patient was shifted to a multiple daily insulin regimen, oral telmisartan 80mg, hydrochlorothiazide 25mg, amlodipine 5mg, aspirin 75mg and atorvastatin 20mg. He then reported pain in the right thigh. On examination, there was diffuse swelling of the right thigh more prominent on the medial aspect with no associated erythema, induration or ecchymosis. There was mild tenderness on palpation but no fluctuation. Range of movement in both knee and hip joints were normal. Right and left thigh circumference was 41cm and 37cm, respectively. USG examination of thigh revealed edematous subcutaneous tissue on medial side with hypoechoic myofascial planes, and edema with blurred tissue interface suggestive of myositis (no definite collection). Doppler study of the leg revealed a normal vascular flow. Fine needle aspiration cytology (FNAC) of the swelling revealed a bloody aspirate, which was sterile on culture. 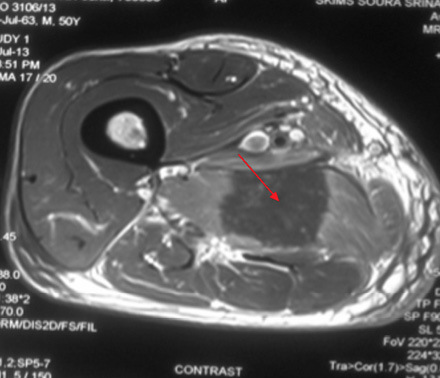 Magnetic resonance imaging (MRI) revealed isointense bulky muscles of medial compartment (adductor longus and magnus) on the right side in T1-weighted imaging and diffuse hyperintense signal and septal edema on T2-weighted imaging [Figure 1A and 1B]. 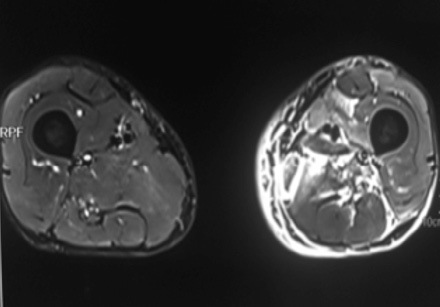 Post-gadolinium enhanced T1-weighted images showed diffuse contrast uptake by affected adductor muscles with central non-enhancing area suggestive of muscle necrosis [Figure 1C]. In the necrotic zone, there were serpentine enhancing streaks suggestive of viable muscle fibers or inflammatory cells, which are a hallmark of diabetic myonecrosis [Figure 1D]. 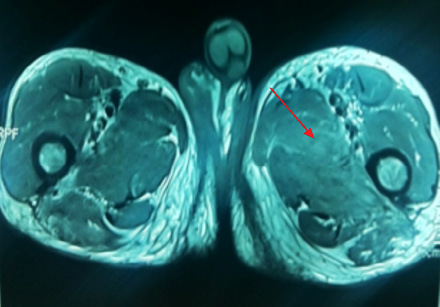 Figure 1A: T1-weighted image showing bulky swollen adductor longus and magnus (red arrow). Figure 1B: Diffuse hyperintense signal on T2-weighted imaging suggestive of edema (red arrow). 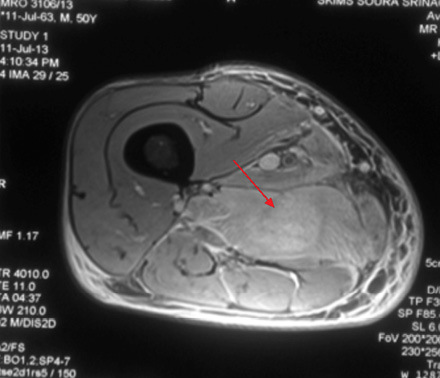 Figure 1C: Post-gadolinium enhanced T1-weighted images showing diffuse contrast uptake by affected adductor muscles with central non enhancing area suggestive of muscle necrosis (red arrow). Figure 1D: serpentine enhancing streaks (red arrow) in the necrotic zone suggestive of viable muscle fibers or inflammatory cells . The patient was managed conservatively with IV antibiotics, analgesics, insulin, and antihypertensive medication. Evaluation for diabetes related complications revealed nephrotic range proteinuria (3.2g/day) and bilateral proliferative diabetic retinopathy. Echocardiography revealed concentric left ventricular hypertrophy. Glycosylated hemoglobin was 9% confirming poor long-term glycemic control. Medical history revealed that the patient had similar complaints of swelling of left thigh approximately one year previously for which he was extensively evaluated. FNAC of thigh swelling was negative for gram and acid fast bacilli staining and culture was sterile. MRI imaging of thigh revealed patchy hyperintense signal on T2-weighted imaging involving medial compartment (adductor longus and brevis) with interseptal edema [Figure 2 and 3]. The patient had received multiple antibiotics and anti-tubercular treatment for a few days. Swelling gradually subsided on its own after two to three months. Figure 2: Coronal section through thigh T2-weighted images shows hyperintense medial compartment muscles. Axial T2-weighted images reveals diffuse high signal intensity in adductor muscles with septal edema. 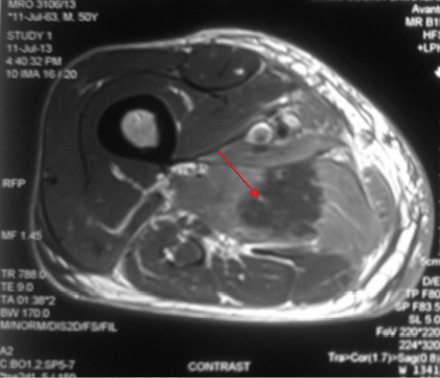 Figure 3: Axial section of thigh T1-weighted images showing bulky isointense medial compartment muscle (red arrow). Diffuse high signal intensity on T2-weighted image (red arrow). The patient was discharged after two weeks with slight improvement in pain and tenderness and had regular follow-up appointments. Complete resolution of symptoms was seen after six weeks. The usual first presentation is sudden onset atraumatic pain, which is severe in intensity, a mass may or may not be palpable. In our patient, although the swelling was sudden in onset, pain, was mild to moderate in intensity. Thigh muscle involvement is most common. Bilateral disease can occur in up to 10% of patients.1 The most commonly involved muscle is quadriceps (87%). The abductors and flexors of hip and muscles of upper limb are rarely affected. Unlike the usual presentation, as observed in other case reports, our patient had involvement of thigh adductors on both occasions. The affected area is usually swollen, erythematous and tender. Constitutional symptoms are rare unlike pyomyositis, abscess and cellulitis, which mount toxic responses.6-8 Our patient presented with a thigh swelling without any erythema and induration. There was mild tenderness on deep palpation with no constitutional symptoms. Routine laboratory investigations are usually noncontributory. CPK, LDH, and white cell counts are usually normal or slightly elevated. In a typical patient with longstanding, poorly-controlled diabetes with associated microvascular complications, like retinopathy and nephropathy, differential diagnosis of acute painful thigh swelling includes cellulitis, myofascial necrosis, abscess, osteomyelitis, vascular thrombosis, and rarely tumors like lymphoma and sarcoma. These conditions can be easily excluded by Doppler, ultrasonography and MRI. 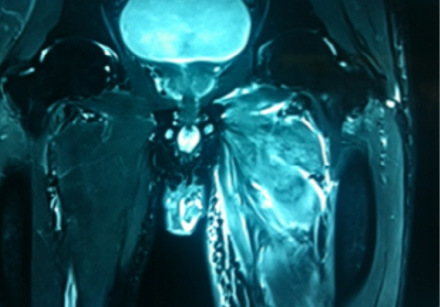 MRI is the best non-invasive modality for the diagnosis of myonecrosis. 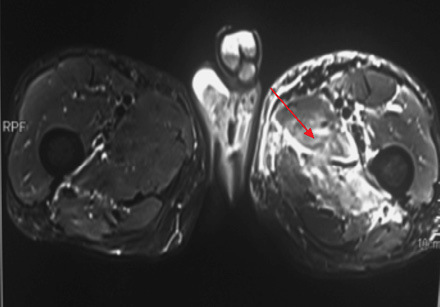 The characteristic feature of diabetic myonecrosis on MRI is isointense swelling of muscles on T1-weighted images with fascial planes around the muscles mildly displaced but fairly well maintained. These features are helpful in differentiating diabetic muscle infarction from tumors, which are generally more heterogeneous and tend to infiltrate and disrupt fascial planes.9 There is diffuse high signal intensity on T2-weighted imaging.10 Post-gadolinium enhanced images can reveal a focal heterogeneously enhancing mass with peripheral enhancement and a central non-enhancing area suggestive of muscle necrosis. Presence of serpentine enhancing streaks in the central non-enhancing area may represent either viable muscle fibers or inflammatory cells separating the necrotic muscle fibers. This feature is a hallmark of muscle infarction.9 Although biopsy is the gold standard for diagnosis, because of potential complications and delayed recovery, it is not recommended.2 In a typical patient of long-standing diabetes with poor glycemic control and other microvascular complications, classical MRI findings will be sufficient for diagnosis. Diabetic myonecrosis is a self-limiting disease and recovery is a rule with conservative management in most cases. With bed rest, good analgesia, and strict glycemic control, most patients recover within six to eight weeks. Some patients may even take 10 to 12 weeks. Surgical intervention is not recommended.11,12 Although short term prognosis of diabetic myonecrosis is good, the long term prognosis is poor due to concomitant microvascular complications. Recurrence in the same or opposite limb is seen in up to 50% of cases2 as in our patient who had myonecrosis in his left thigh in the past. Diabetic myonecrosis is an underdiagnosed complication of long-standing diabetes. A clinician should always keep in mind the possibility of diabetic myonecrosis in a patient with long-standing, uncontrolled diabetes who presents with sudden onset painful leg swelling, especially in the presence of other microvascular complications. Typical MRI findings are sufficient to reach a definitive diagnosis without subjecting the patient to invasive investigations. Recovery usually occurs with conservative management. Angervall L, Stener B. Tumoriform focal muscular degeneration in two diabetic patients. Diabetologia 1965;1:39-42 . Trujillo-Santos AJ. Diabetic muscle infarction: an underdiagnosed complication of long-standing diabetes. Diabetes Care 2003 Jan;26(1):211-215. Habib GS, Nashashibi M, Saliba W, Haj S. Diabetic muscular infarction: emphasis on pathogenesis. Clin Rheumatol 2003 Dec;22(6):450-451. Ratliff JL, Matthews J, Blalock JC, Kasin JV. Infarction of the quadriceps muscle: a complication of diabetic vasculopathy. South Med J 1986 Dec;79(12):1595. Palmer GW, Greco TP. Diabetic thigh muscle infarction in association with antiphospholipid antibodies. Semin Arthritis Rheum 2001 Feb;30(4):272-280. Khan S, Al-Riyami D, Al-Ghailani M, Al-Dhuhli H. An Under-recognized Complication: Diabetic Myonecrosis. Oman Med J 2009 Jul;24(3):228-230. Mancillas-Adame LG, González-González JG, Jáquez-Quintana JO, Cardoza-Torres MA, García AdeL. Diabetic myonecrosis in a patient with hepatic cirrhosis: a case report and review of the literature. J Med Case Rep 2009;3:9305. Choudhury BK, Saikia UK, Sarma D, Saikia M, Choudhury SD, Bhuyan D. Diabetic myonecrosis: An underreported complication of diabetes mellitus. Indian J Endocrinol Metab 2011 Jul;15(Suppl 1):S58-S61. Jelinek JS, Murphey MD, Aboulafia AJ, Dussault RG, Kaplan PA, Snearly WN. Muscle infarction in patients with diabetes mellitus: MR imaging findings. Radiology 1999 Apr;211(1):241-247. Chason DP, Fleckenstein JL, Burns DK, Rojas G. Diabetic muscle infarction: radiologic evaluation. Skeletal Radiol 1996 Feb;25(2):127-132. Kapur S, McKendry RJ. Treatment and outcomes of diabetic muscle infarction. J Clin Rheumatol 2005 Feb;11(1):8-12. Bjornskov EK, Carry MR, Katz FH, Lefkowitz J, Ringel SP. Diabetic muscle infarction: a new perspective on pathogenesis and management. Neuromuscul Disord 1995 Jan;5(1):39-45.